Hardneck form; so-called because the stem dries hard in the centre of the bulb. Cloves are larger, and easier to separate, than the softneck type. Does not store quite as well as softneck garlic. Bulbil-bearing stems are curiously looped, as if tied into loose knots by mischievous elves. 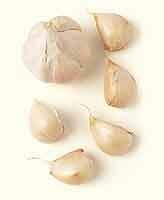 Both the underground bulbs and the above ground bulbils are esteemed for their strong garlic flavour. -MUSIC Best yielding strain, preferred by commercial growers in Ontario.